See poster for details. A programme that includes Czech music that you may not have heard before. All Singers and Orchestral Musicians are warmly invited to Come and Sing or Play Faure's Requiem with The Caithness Orchestra, conducted by Susie Dingle on Saturday 14th April 2018 in The Pulteney Centre, Wick. Please come and join the Caithness Orchestra for a day (10.00am-1pm and 2-5.00pm) rehearsing Faure's Requiem (Hamelle version including violins in the orchestration). 3rd - 6th August 2017. See poster for details..
All Singers and Orchestral Musicians are warmly invited to Come and Sing or Play Handel's "Messiah" with The Caithness Orchestra, conducted by Susie Dingle. There is a charge of £10 per participant. 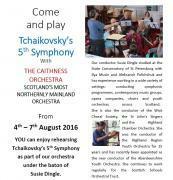 SCOTLANDS MOST NORTHERLY MAINLAND ORCHESTRA. From 4th - 7th August 2016. Come and Sing or Play The Messiah! All singers and orchestral musicians are invited to join the Caithness Orchestra for a day to play/sing and rehearse selected choruses and arias from Handel's Messiah. Members of the public are welcome to join us at 4pm to listen to an open play-through of Messiah excerpts covered during the day. THE popular Caithness Big Band returns to Wick's Norseman Hotel, later this month, for a charity bash in aid of the Caithness Heart Support Group. It's one of the group's biggest fundraisers and tickets both for the event, on September 13, and raffle, are available. Fresh from the success of their recent appearance at the Caithness Music Festival, where they scored one of the highest marks of the week (an outstanding 90) the Caithness and North Sutherland Adults Choir are looking for new members to join their very successful, fun choir. At present there are approx 30 enthusiastic female members who would welcome any new members with a healthy appetite for singing for pleasure. 12 April 2014 10.00am - 5.00pm St Fergus Church, Wick All singers and orchestral musicians are invited to come and join the Caithness Orchestra for a day (10am-5pm) playing & rehearsing extracts from Mozart’s “Requiem”. The conductor will be Susie Dingle. All Singers and musicians are welcome to come and join the Caithness Orchestra for a day playing and rehearsing selected choruses and arias from Handel's "Messiah." The day (15th April 2013) will be conducted by Susie Dingle and will run from 10.00am - 5.00pm with breaks for lunch and snacks. At 4.00pm, members of the public are welcome to come and listen to an open play-through of the work covered during the day. Tuesday 28th August sees the start of a new season for the Thurso & Dounreay Strathspey & Reel Society. Old and new mebers are invited to get the instruments tuned up and come along when practice starts again at the Ormlie Lodge club, Thurso.